Experience the Magic of a Real-Life Unicorn! 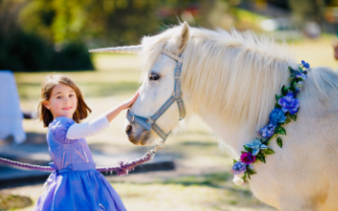 Unicorns are loved by kids of all ages and now, they can experience the magic and beauty of a real-life unicorn! Enjoy a unicorn ride and 'tea' experience, giving you plenty of photo opportunities and the experience of a lifetime! Or choose an exclusive experience, where the unicorn comes to you for a private visit at home or your local park. This is what dreams are made of! 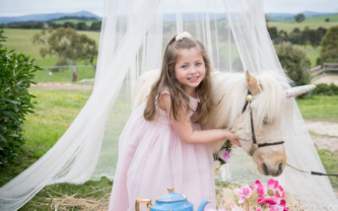 Melbourne's magical Unicorn Experience includes riding a magical unicorn, Devonshire tea and more! Unicorn Parties are a favourite amongst children (and mums)! 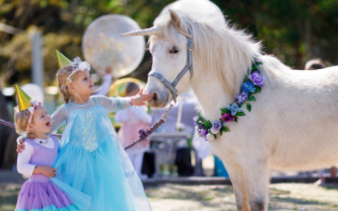 Choose your favourite from our range of unicorn parties, this is a party they'll remember forever!